Zotero is a citation manager. It makes citing sources easy, but better yet it makes organizing your sources really easy too. This helps you document the information you borrow. Zotero can do a lot for you, check out the short instructions below to get started and link to expanded documentation if you're interested. Fully using Zotero involves a cloud-based interface or download program and a browser extension. This will be your online account, which allows you to check your sources on any computer, regardless of whether the Zotero add-on is installed. For full functionality, download the Zotero program and install the add-on for your preferred browser. 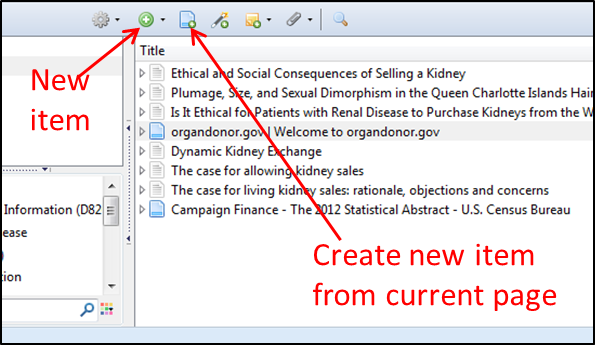 You'll use the add-on to add sources from library databases and websites, and the program to organize your sources. Step #3: Sync your Zotero account. This will sync your online Zotero account and the add-on you've installed in your personal browser. That way, no matter what computer you're using, you can see the documents you've saved in your account. To sync. go to the settings icon, select "Preferences" from the drop-down menu, and then go to the "Sync" button. You'll want to create a collection to group all the sources you find for one project together. To create a collection, go to the Zotero window, and click on the folder in the top left-hand corner. If you already have items in your main library, you can drag and drop those into the collection folder. To select a specific citation style for all your citations, go to gear button (or edit in the menu), then Preferences--> Export--> Default Output Format, and select the style you wish to use. If you don't see your preferred citation style, click on the Cite folder icon and click the Get Additional Styles link at the bottom of the citation style window. Also under the Cite folder icon, you can install the Zotero add-on to Word or LibreOffice, which makes inserting your bibliographies into your papers even easier. The easiest way to add items to your collection is when your searching the article databases and internet. 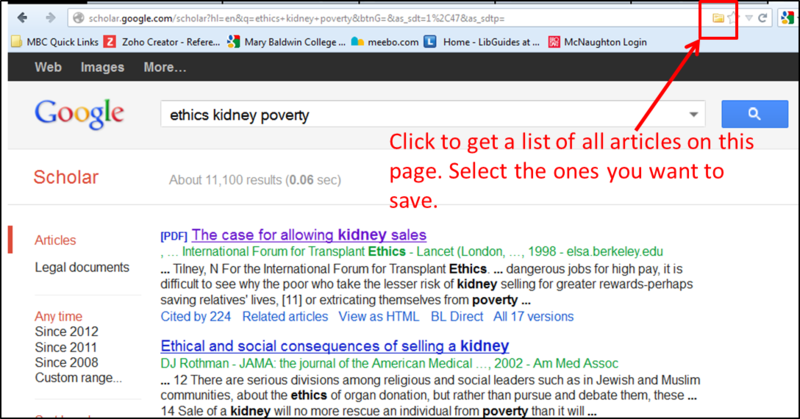 When you see an item that you want to save, look for an icon on the right-hand side of the URL box. The icon looks like a little piece of paper. You'll get this icon when you're on the record of a specific article. Clicking on this will add the bibliographic information, full-text if its available and any keywords or tags associated with the article to your collection. If all you have now is the abstract, you can always add the full text later. Once you've saved the article in your library, you can click on the triangle next to the article to get a saved copy of the full-text, if it was available. You can also see keywords associated with all the aritcles in your collection. When you see this icon, it usually means you're on a page with a list of documents. If you click on the folder icon, you'll get a pop-up list of all the documents on the page, and then you can select the ones you want to save. You'll want to use the folder icon when you click on the document and it goes straight to the pdf. If you try to save the document when its in PDF format, Zotero won't pick up any of the bibliographic informaiton, but if you save the item through the folder icon, you'll get that bibliographic information. You'll often get this icon when your browsing on webpages with no documents attached. If you click on this icon, Zotero will save the information from the webpage you're currently visiting. Create a new item from current page. If you don't want to use the items, you can also use the button on your Zotero window that allows you to create a screenshot of your current page. This will come up with basic bibliographic information, such as title, date and URL, but you'll have to fill in the rest. Or you can manaully input an item and add all the bibliographic information in yourself. Before you create your citations, remember to set up your default citation style. Go to Edit-->Preferences--> Export--> Default Output Format. To create a single bibliographic citation, just drag the record from the middle column of your Zotero window into whatever new location you'd like it to go. It can be a Word document, blog, e-mail, etc. To create bibliography of all documents in a collection, right-click on the collection folder, and select "Create Bibliography from Citation...". Then, if you select "copy to clipboard", you can just paste the citations into your Word document. To create in-text citations, you'll need to install a word processor plug-in. More information on that here.